Jeannine believes that honesty, empathy and education are the most important tools in fostering strong patient relationships. In her free time, Jeannine enjoys reading, cooking and playing with her rescue dog, Buddy. 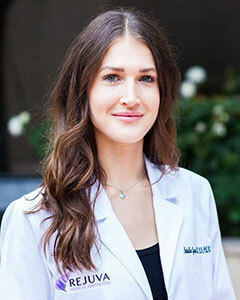 Kasey is devoted to helping her profession grow by educating PAs, Physicians and the public about the PAs role in medicine today. Her upbeat personality and business experience make her a very effective consultant, coach, mediator and educator for physicians and PAs. She has been published in Practical Dermatology, JDPA, and other journals. Natalia Guzman BSN, RN, CANS. is a highly skilled Los Angeles based Cosmetic Nurse Injector with over 10 years of experience. She has trained and worked along-side some of the most accomplished cosmetic surgeons in the world and comes to Rejuva Medical Aesthetics with a wealth of knowledge and expertise.Natalia believes the consultation and pre-treatment discussion is key to developing a personalized plan that allows both her and her patient to be fully invested in their care from beginning to end. Natalia offers a myriad of treatments, including Botox, Dysport, Xeomin, Juvederm, Radiesse, Belotero, Restylane, Kybella, Sculptra, Halo Laser Resurfacing, IPL/BBL, and Microneedling with PRP. Natalia focuses on providing each patient the ultimate combination of incredible skill, offering the latest techniques, and her innate artistry creating natural and youthful outcomes. Caysie Beetley, RN, BSN is a Los Angeles based aesthetic nurse specialist. She began her nursing career in the Emergency Department where she developed a passion for delivering high quality care to her clients. Her previous experience as a Plastic Surgery nurse at the University of Kansas Heath System introduced her to the exciting world of aesthetic and cosmetic procedures. She obtained certifications in injectables and laser treatments through MINT Aesthetics and continues to refine her skills by working alongside Dr. Kian Karimi and attending the latest aesthetic training seminars. Caysie believes that client safety and satisfaction is of upmost importance. Through trust, education and communication she is able to build strong client relationships and deliver optimal aesthetic outcomes. Jennifer Izzarelli is a Board Certified Acute Care Nurse Practitioner and Certified Aesthetic Nurse Specialist. Jennifer earned her Master of Science in Nursing from the University of California, Los Angeles (UCLA) where she was one of only twenty five students chosen for dual specialties: Nurse Practitioner and Clinical Nurse Specialist. Jennifer spent several years as the sole Nurse Practitioner working alongside surgeons in the Plastic and Reconstructive Surgery department at Harbor UCLA Hospital and at UCI Medical Center. She was introduced to aesthetics in 2013 where she fell in love with the concepts of combining her surgical training with non-surgical beauty treatments and facial design. Serving the Greater Los Angeles and Orange County areas, she is a leader in both surgical and non-surgical aesthetic beauty treatments. She mentored alongside of Rand Rusher and received exclusive training on the patented non-surgical ArqueDerma® Lift. She is a master injector providing advanced neuromodulator treatments to the face and neck along with her vast knowledge of skincare and lasers. Sherry joined our practice in 2015. She graduated from UCLA with a major in English and then obtained an advanced degree in Health Care Administration from UCLA. She has 28 years of experience in healthcare and through her leadership and passion for the aesthetic industry has played a significant role in the expansion and continued success of Rejuva Medical Aesthetics. In addition to managing business operations, she is involved in all aspects of the practice including marketing, public relations, sales and patient satisfaction. Sherry feels very fortunate to be a part of such an innovative practice focused on the latest technology, offering the most beautiful, natural results possible. Alex Reivitis is Rejuva’s medical assistant who also oversees our clinical research trials. 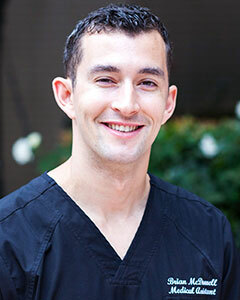 Prior to joining our practice, Alex spent over two years as a medical assistant in a dermatology clinic. Additionally, she was an intern at Children’s Hospital Los Angeles in the Plastic/Maxillofacial Department for three years. Born and raised in Los Angeles, she attended Loyola Marymount University, where she received her undergraduate degree with honors in Biopsychology. Alex continued her education at Loyola Marymount by completing a two year premedical post baccalaureate program. During her time in the program, Alex was a research coordinator for a genetics lab and earned her Phlebotomy license at UCLA. She also co-founded a non-profit called Sunscreen for Life, which seeks to educate today’s youth about skin cancer prevention. As an aspiring physician, Alex is extremely enthusiastic about healthcare and is excited to be a part of Rejuva. Helena Rockwell is a medical assistant and clinical research coordinator who officially joined the Rejuva staff after graduating from the University of California at Davis. With a love of horses but a passion for pursuing a human-based medical career, Helena received her Bachelors of Science with honors in Animal Science with a Physiology Specialization. Throughout college, Helena was actively involved in pre-health clubs, healthcare volunteering, medical internships, and she conducted research in characterizing the congenital nature of diseases in horses in order to better understand the genetic basis of human equivalents. Returning to her home of Los Angeles on college breaks, Helena would shadow Dr. Karimi and Dr. Griffiths at Rejuva. As an aspiring physician, Helena is eager to learn about all fields of medicine and is very excited to be a part of Rejuva’s team. Austin Davis-Hunter is a Medical Assistant at Rejuva who joined the team after completing his Bachelors of Science in Psychobiology at UCLA. During Austin’s time at UCLA he conducted undergraduate research in behavioral neuroscience and worked as a caseworker for the UCLA Mobile Clinic Project. His research background and clinical experience has furthered his interests in the medical field. As an aspiring physician Austin is excited to be at Rejuva and diversify his medical background by working in the realm of Aesthetics. Brian is a Medical Assistant at Rejuva. He has taken a special interest in PDO Threads, PRF, and combination therapies and is Rejuva’s coordinator for the monthly AIAM hands-on trainings. Brian is a California native, born and raised in Orange County. He graduated from Cal State Fullerton, University with a Bachelor of Science in Kinesiology. He is an aspiring Physician Assistant and his previous medical experience includes working as a Medical Assistant in the fields of Sports Medicine, Orthopedics, Pain Management, and Anti-Aging. 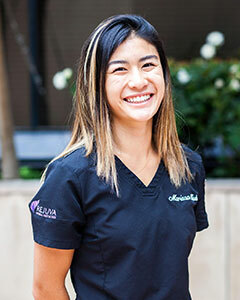 Marissa Kudo is a medical assistant and clinical research assistant at Rejuva who joined the team after graduating from the University of California, Santa Barbara with a Bachelor’s of Science in Biological Sciences. In college, she volunteered in many departments of healthcare including emergency, ICU, and research and became EMT certified to pursue her medical interests further. As an aspiring physician, she hopes to continue to learn about healthcare as a part of the Rejuva team.